The brand ‘Sage by Heston Blumenthal’ has earned an excellent reputation when it comes to coffee machines. 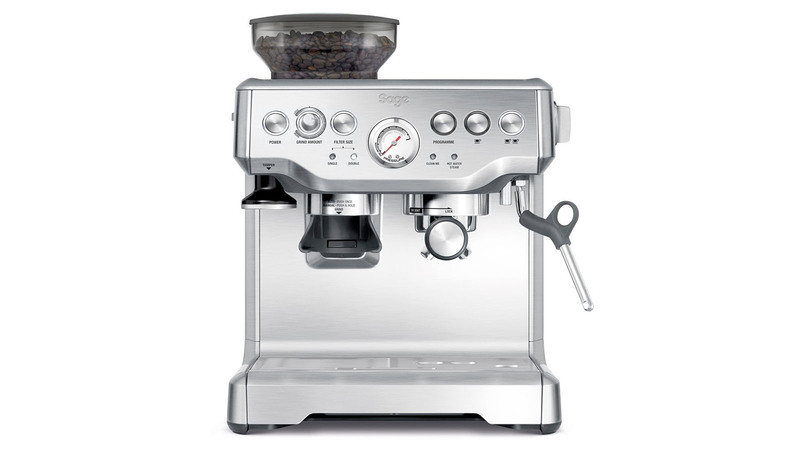 The Sage by Heston Blumenthal BES870UK is brand’s mid-range machine and is perfect if you want to make barista-grade coffee at home. At £499 it’s competitively priced too. Espresso: The Sage by Heston Blumenthal BES870UK lets you take a modular approach to making your coffee. If you’re looking for a machine that makes a coffee at the press of the button, be warned, this isn’t it (take a look at our Jura E6 review instead). With the BES870UK, you’re in control of every stage from filing the water tank to frothing the milk. See also: The Best Coffee Machines of 2017. Your first step is filling the removable 2L water reservoir. The next job is filling coffee bean grinder with a bean of your choosing. You can skip this step and use pre-ground coffee, but we’d recommend grinding your own coffee, as you’ll be rewarded with a better brew. Now that the coffee grinder is full you need to select how you want to grind your beans. 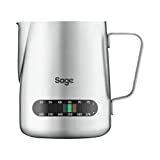 This is where the Sage by Heston Blumenthal BES870UK’s manual controls really benefit you. The machine comes with two different machine portafilter heads and two preset coffee options to match – this lets you grind one or two shots of espresso at the same time. The machine comes with a magnetic Razor card for levelling off the ground coffee and temper for compacting the grind into your portafilter. This machine also gives you 18-different levels to let you control how fine you want your ground coffee to be. This is going to vary from bean-to-bean and finding your personal preference is going to take some trial and error. But it’s worth it. All that’s left – on the espresso side of things – is pressing a button. Do you want a single or double espresso? If you’re not happy with the strength of these brews, you can override them and program your own using the Preset button. Or, you can hold down the one-cup button and the machine will force water through your filter until you take your finger off the button. Milk: The machine comes with a milk steaming wand and jug. Frothing your milk is a manual affair too. The one issue here is that the hot water used to steam the milk comes from the same reservoir that’s used to make espressos, so there’s a short wait for the water temperature to reach the correct milk-steaming level. We advise to just turn the dial and wait for the steam. When you have steam, insert your milk jug and then it’s judgement call. There are pros and cons to the milk-steaming options here. It’s a little clumsy and fiddly, but it gives the barista total control of the milk steaming – which sticks with the machine’s overall theme over giving you total control. Cleaning this machine is pretty easy. It’s done in two parts. First, you need to locate the grey silicone cleaning disk, located in the storage tray at the bottom of the machine and insert it into the grooved handle. Next, you need to run a few shots of espresso (without any coffee grind, obviously) to flush hot, clean water through the pipes and funnels. Occasionally you’ll need to use descale the machine as well, this is outrageously simple. Just pop a descaling tablet into the groove head and run the built-in descaling function. That’s all you need to do for the espresso side. The other section that needs regular cleaning it the milk frother. Again, the best way to do this is by running hot water/stream through the wand. If you use the milk frother and don’t clean it for a couple of days the holes at the end of the nozzle might get a bit blocked. When this happens, use the pin that’s provided to release the nozzle from the wand, then soak it’s until unblocked. You can’t fault the Sage by Heston Blumenthal BES870UK’s design. It looks professional (because it is professional) and its neutral colours will look great in any kitchen. It’s not the smallest of coffee units available though, so make sure its 350x380x370mm dimension fit in your kitchen before purchasing. The machine is serious about coffee. 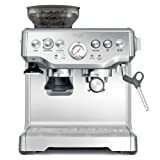 If you are too and you don’t mind spending 30-60 seconds making an espresso/latte, then you’re going to love the control Sage by Heston Blumenthal BES870UK gives you over your coffee. Not quite what you’re looking for? Take a look at the Smeg ecF01 review: The BEST looking coffee machine of 2017. Got a Mac? Check out this Best Antivirus For Mac 2018: The 7 BEST Mac Antivirus Suits article.